HOLLYWOOD, Calif. — Remember the good old days of air travel, where seats were plush and comfortable, dinner was served on fine china (even in coach), and you could sip a cocktail in a lounge 30,000 feet in the air? 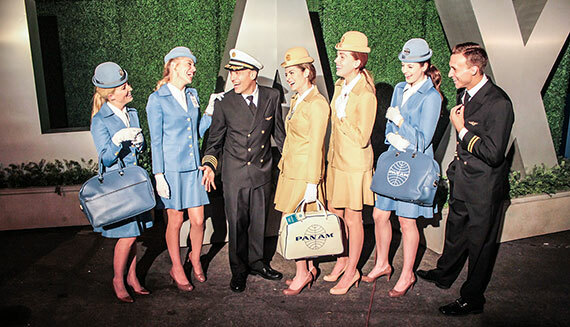 A company called Air Hollywood apparently does, launching something called the “Pan Am Experience”. The company is now offering monthly dinner parties aboard an exact replica of a Boeing 747, decked out just like Pan Am flights were laid out in the 1970’s. There are two packages offered: for $200, guests can have a Clipper Class seat – complete with cocktails, dinner, and an in-flight movie. For $300, visitors are treated to the First Class cabin on the upper deck of the plane. Flight attendants dressed in 1970’s Pan Am uniforms are on hand to greet guests, and will be serving dinner on authentic Pan Am china, linens, and glassware. After dinner, guests will be able to view other airline memorabilia and film production sets. It should be noted: the Pan Am Experience is not a real flight; it does not actually take off, land, or go anywhere. The $200/$300 experience is on board a production set at a Hollywood studio. The first Pan Am Experience dinner is scheduled for later this month, with monthly dinners through the remainder of 2014.